While recently looking into the cases that landed three comics on the Top Ten List of Frequently Challenged Books for 2014, we came across a veritable treasure trove of challenges that had flown under our radar: the Texas ACLU’s Annual Banned Books Report. Besides the challenges to Persepolis and Drama that we already covered, the report shows that censorious Texans requested the removal of three additional graphic novels and two entire series from their local schools in 2013-2014. One case is still pending, but happily the other books have all been retained. The pending challenge concerns Kim Gong Hwa’s The Color of Water at Gus Garcia Middle School in the Austin Independent School District. According to the ACLU report, the book was challenged for sexual content–and it’s certainly not the first time for that, considering that the Color of Earth series came in second on the 2011 Most Frequently Challenged list compiled by the American Library Association. We found no news coverage of the Austin challenge, nor any mention of it in the school board meeting minutes for all of 2014, so we hope that means the book is receiving careful consideration from a review committee in accordance with the “formal reconsideration” procedure outlined in the district’s policy on Instructional Materials. Educators interested in incorporating the Color of Earth series in their curricula should check out our Using Graphic Novels in Education resource! Another “usual suspect,” Stuck in the Middle edited by Ariel Schrag, was challenged for profanity and retained at Rockport-Fulton Middle School in Aransas County Independent School District. The comic anthology about middle school has previously been challenged and restricted in other locations including Dixfield, Maine and Sioux Falls, SD, so we are pleased to hear it remains in circulation at Rockport-Fulton although we were unable to find further information on the challenge. We also have a Using Graphic Novels in Education column for Stuck in the Middle. The broadest challenge which sought to remove two entire series plus a single graphic novel–a total of 16 books–was also the one for which we found the most information, thanks to a journalism student’s semester project. Last October, Texas Christian University student Molly Spain submitted a FOIA request to the Fort Worth Independent School District seeking information on any book challenges or bans from the past two years. The district had one case to share with her: the grandparent of a student at JT Stevens Elementary School last year requested the removal of Bone (series) by Jeff Smith, Amulet (series) by Kazui Kibuishi, and Ghostopolis by Doug TenNapel from the school library. According to one of the released documents, the complainant apparently objected to a kissing scene in Ghostopolis as well as unspecified language and violence in all the books. Though the library serves a diverse population and, therefore, must include a diverse collection of materials, students have the right to choose whether or not to read various books in the library. Nevertheless, parents may discuss boundaries and set limits for their own students in regard to what their students are allowed to read. The committee recognizes that the books in the Amulet, Bone, and Ghostopolis series may not be liked or deemed appropriate by all, but the committee has determined that these books have educational value for the student population at JT Stevens and will be retained. Although the ACLU report shows that access to the books was restricted for some students, we suspect that is due to a miscommunication. In the course of their duties the committee members did consider whether the books were appropriately shelved for their reading level, and concluded they were right where they should be–in a section for upper elementary students. The committee did not recommend moving the books to a restricted area, nor did it indicate that younger students who might want to read them would be barred from checking them out. The ACLU’s conclusion that the books were restricted probably stems from an email sent by Fort Worth ISD Library Media Services Director Carter Cook, in which he said the books “would be shelved separately in the library for upper elementary students to check out and not interfiled with the library books that primary grades usually select.” This is accurate, but it represents no change in the books’ status from before the challenge. 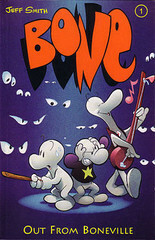 Bone is also no stranger to challenges; it made the Top Ten list for 2013 due to previous cases also in Texas. (Although some might be tempted to stereotype Texas based on all these challenges, it should be noted that the high rate of reports from there is likely due in part to the sheer size of the state, and to the efficiency and vigilance of the local ACLU chapter.) These are the first challenges we’ve heard of for Ghostopolis and Amulet, but we already happen to have a Using Graphic Novels in Education column for the latter. Kudos to all three of these school districts! Just by observing their policies already in place, they were able to ensure that books were not banned or restricted based on the objections of one person. That may sound like a relatively simple task, but too many school districts around the country have a propensity to abandon their challenge policies at the slightest hint of controversy. Standing by any book that’s been publicly accused of corrupting children actually takes a fair amount of administrative backbone.